In a continued effort to give back to our community Get Write Entertainment Get Write Entertainment will also be working closely with two local organizations to donate a portion of the proceeds from this play to their cause. 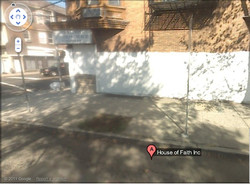 House of Faith, a non-profit transitional housing residence that provides a range of supportive services to homeless adults, both men and women transitioning to independent living. PRYD (Positive Reinforcing Youth Development) a non-profit organization that provides constructive programs and events for youth between the ages of 5-18 years of age. There motto reads "Am I my brothers keeper,...Yes I am."